Christmas is like, next week. I know, I’m freaking out too. In this season of creepy diamond commercials and overspending I wanted to take the opportunity to remind you of two things. 1. B&S, this very website, has a store. Not full of plastic toys and crap that will break 24 hours after Christmas but of real, sturdy, hearty products that I recommend from the bottom of my heart. 2. In this time of cooking and overserving, we also have a Guide to Holiday Eating. It’s by far our best yet. 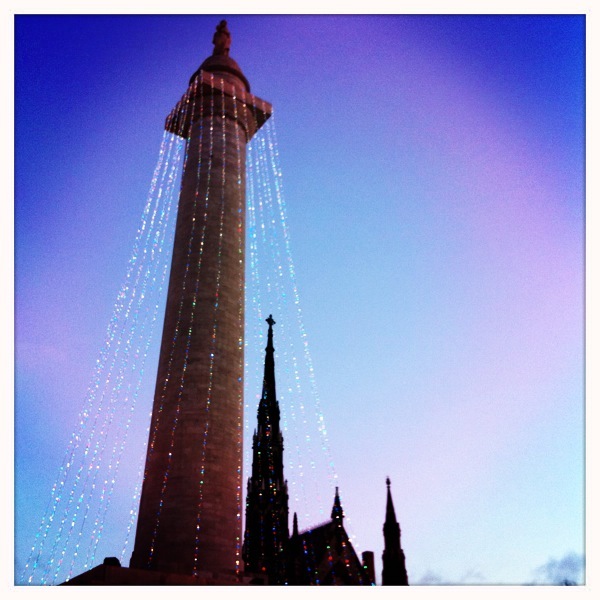 I’ll leave you with those thoughts and a photograph of the country’s first monument to George Washington, all decorated for the Holidays. Hope your season is as snowy and magical as you’d like it to be. This was a bad week. Actually, the past two weeks have been bad, which is why last week, for the first time in a very long time, there was not a new post in this little corner of the internet. It’s nothing major, just a lot of little stresses at work and at home that built up and, when combined with the cold, my new desire to be a runner (a dubious plan), and the short hours I just… needed to check out. I did a lot of snuggling with Dan, we exchanged a few early Christmas presents, and I began planning 2011. Today we had absolutely nothing to do so we stayed in bed forever, baked cookies and made apple butter, took ourselves out for lunch, and had a dance party in the kitchen. It was much needed. And, as always, I am very lucky to have such a wonderful husband. 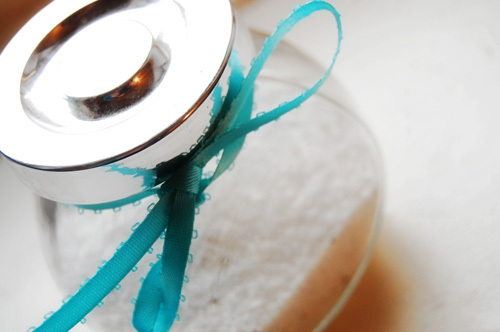 This week’s recipe is something that came just in time for our holiday baking- vanilla salt. First off, I have a confession to make. I am a salt addict. 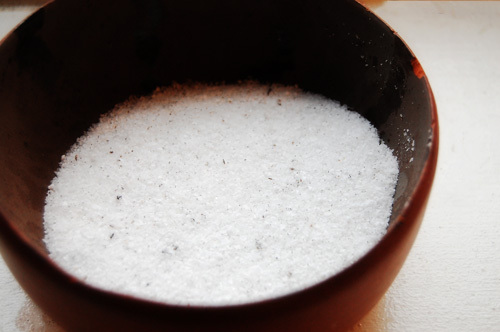 I buy either kosher or sea salt so it comes in big crystals and in addition to adding it to flavor a dish, I love to sprinkle it on just about everything for an extra punch. Lately my breakfast of choice has been a toasted bagel or piece of toast with herb butter and a dash of salt. So simple, yet nothing seems to be as delicious lately as that burst of salt. Today’s salt shout out goes to vanilla salt. 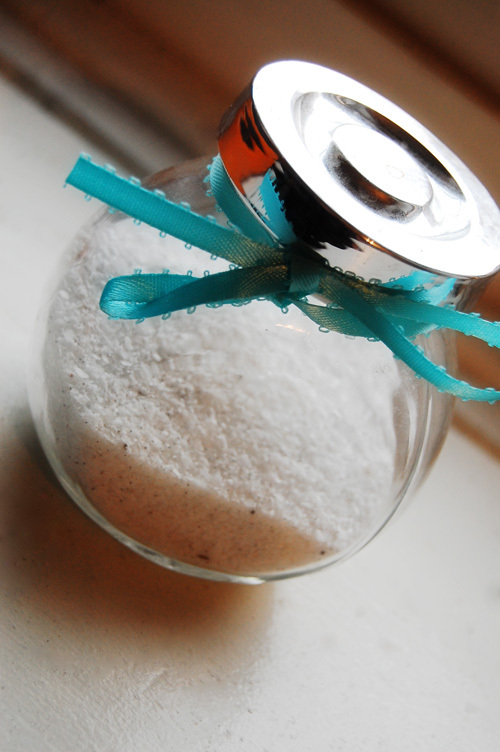 A mixture of pure vanilla and kosher salt, this has already proved delicious on top of sugar cookies and salmon alike. I see a future for this on top of caramels, steaks, and (of course) toast. You’ll love it, as will anyone you decide to share it with this holiday season. 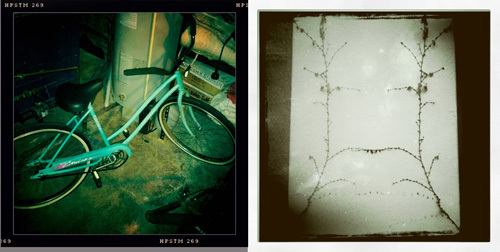 For Christmas this year Dan gave me a (beautiful) new bike(!) equipped with basket and bell! All it needs are fenders and I’ll be cruising in style. And a paint job. It has crackle paint on it. Outside my love for salt (and other things that will ultimately kill me) I have some good news and some bad news. Or, depending on what day of the week it is, two exciting pieces of news. On the one hand, B&S was named one of the “Top Southern Style American Cuisine Blogs,” something that we found to be incredibly flattering. We’ve been getting a lot of incredible press lately and I can’t say thank you more sincerely. It means the world to me, especially on the bad days. The other hand, however, is the news that my iVillage column, From Arugula to Ziti, that has been published weekly in their Food News section since November of last year, has been cancelled. Something about budget cuts and the recession (and maybe the big sale to Comcast). I have mixed emotions about it. I’ve enjoyed writing it and it has been a great outlet for writing about the things that don’t fit on B&S. However, with all the little projects we’ve got going on it had begun to take its toll and I was a little relieved when I got the news. Plus, this will just allow a window to open for other, more exciting, activities. *Playstation has no idea who I am, they definitely neither sponsored this post nor gave me a free Playstation Move. But Dan and I are killing it in virtual bocce. Scrape out the insides of one vanilla bean. Mix with salt. Store in an airtight container. Sprinkle on everything to add deliciousness. Thanksgiving is my favorite holiday. That is, that I like the actual day of Thanksgiving more than any other holiday. Christmas, Easter, Valentine’s Day, my birthday. Thanksgiving wins. It wins because its only goal is food. The only point is to come together with people you love and enjoy delicious food. That being said, there are few times of year I love more than the stretch between Thanksgiving and New Year. I love singing Christmas carols. I love decorating my house. I love baking, I love shopping for the people I love. I love giving presents, even if waiting to give someone something special kills me. I love going to church on Christmas eve and watching my dad try to stifle giggles everytime the preacher references the sweet baby Jesus. I love that when we celebrate with my grandfather’s family my great Aunt Beth puts a flashing Christmas light in her belly button. I love that growing up, my Uncle Ron used to make us wait on the steps Christmas morning for what seemed like hours while he got showered and shaved and dressed. I love that on Christmas day, after the presents and before the family dinner, my sisters and I lay around and eat. I love that my husband can barely contain himself after buying something for me, but swears up and down that he won’t tell me what it is until Christmas. 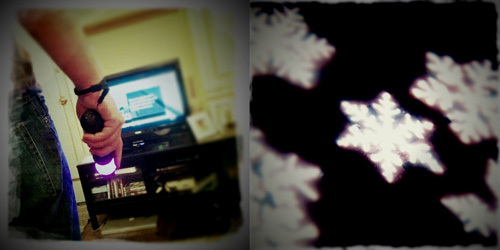 I love this season. And to kick it off this weekend I listened to Christmas music, I watched Love Actually, I decorated our tiny apartment, and I made fudge. 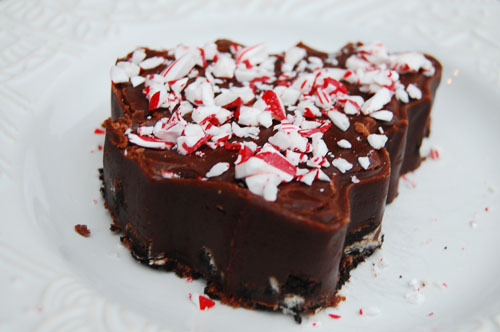 Peppermint fudge with an chocolate creme cookie base and candy cane sprinkles. In a heavy pan, combine milk, cream, chocolate, sugar, and half of the butter. Cook over medium heat until everything has melted. Bring to a boil. Insert a candy thermometer and allow to boil, stirring occasionally, until the temperature reaches 240. Cut the heat. Add the remaining butter and let sit for 10-12 minutes. 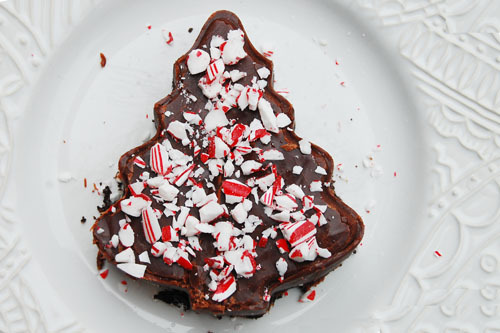 While your fudge is cooling, line a small cake pan with wax paper. Crumble cookies and spread over the bottom of the pan. Now comes the hard part. With a spoon, beat the fudge for at least 7 minutes. This is going to make your arm feel like it will fall off, but keep beating to incorporate air into the fudge. After 7 minutes (good job!) pour the fudge over the cookies, spreading evenly. Let sit overnight to cool. 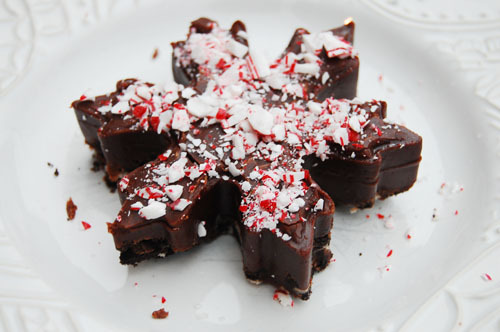 The next day, use a cookie cutter (or just cut squares) to cut out pieces. 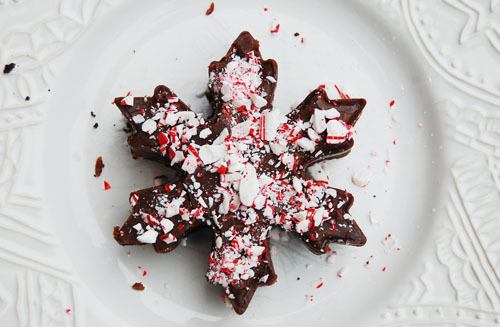 Crush candy canes and sprinkle on top.